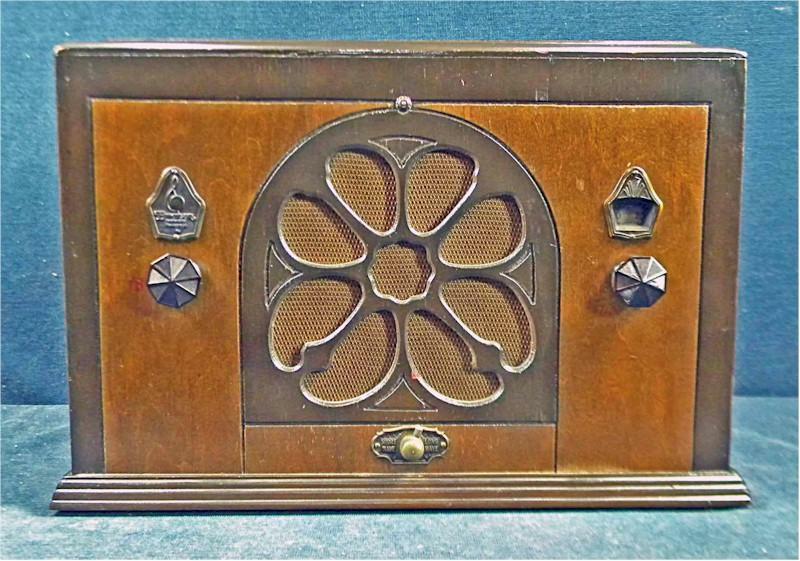 This is a rather early super-het table radio from Emerson Radio. The set is so early, the dial still uses 0-100 on the dial scale rather than the later dials 55-1700. The radio looks to be an older refinish, and a darn good job. The knobs, speaker cloth and various bronze escutcheons are correct and factory installed. This is a four-tube model, with a band switch on the face of the radio, allowing you to change from short to long band shortwave channels. The radio was repaired by my technician. His work returned this set to a be a great player. He also replaced the factory and tired power cord and plug with a fine silk reproduction cord and Bakelite plug. The radio is sure to be a dependable player! 14"W x 10"H x 7-1/2"D.
You are visitor number 3,297 to this page.